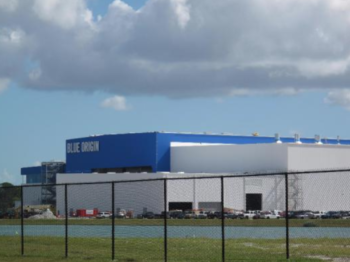 With their large production facility on Merritt Island nearing completion of its initial build, construction of their launch pad and testing facilities proceeding well, and a successful first firing of their BE-4 engine, Blue Origin is on track to meet the company’s stated goal of debuting their New Glenn heavy lift launch vehicle sometime in 2020. 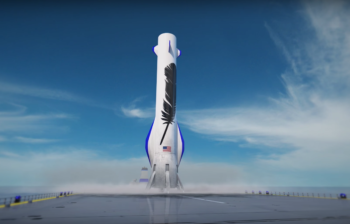 Blue Origin is making impressive strides toward their anticipated debut within the orbital space community – with manufacturing facilities, control buildings, launch pad, and testing facilities all making excellent progress toward the company’s stated date of NET 2020 for New Glenn’s introduction. Under its current design, New Glenn is a two- or three-stage-to-orbit heavy lift launch vehicle capable of delivering 44,906 kg (99,000 lbs) to LEO (Low Earth Orbit) and 13,154 kg (29,000 lbs) to GTO (Geostationary Transfer Orbit). Its two stage configuration will stand 86 m (283 ft) tall and 7 m (23 ft) in diameter while its three-stage variant will be 99 m (326 ft) tall. According to information released by Blue Origin, New Glenn’s first stage will be powered by seven of the company’s BE-4 engines, producing 3.8 million lbf (1.72 kgf) at liftoff. The first and second stages will each burn commercially available, not pure, methane as well as liquid oxygen (LOX) while the optional third stage will burn LOX and liquid hydrogen (LH2). 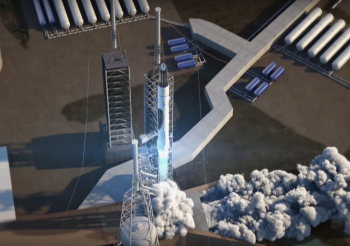 The second stage will utilize a single BE-4 engine optimized for use in a vacuum while the third stage will use a vacuum-optimized BE-3U engine – the same engine used on Blue Origin’s suborbital New Shepard rocket. New Glenn will launch from LC-36 at the Cape Canaveral Air Force Station, where construction of the new launch facility, its hardware, support and integration buildings, lightning protection system, and access roads are ongoing. In building the new pad, Blue Origin opted to completely demolish what was left of LC-36 and build anew. According to a recent update provided to the USAF Space & Missile Museum Volunteers by Scott Henderson, director of Orbital Launch Operations for Blue Origin, the company is in the process of driving 200+ foot poles into the ground at LC-36 to support the future launch pad. All of the concrete that previously served the LC-36A and B pads has been removed; however, instead of hauling the good concrete away, Blue Origin recycled and repurposed it – using the concrete as the base for the new road network needed for the redesigned pad. In particular, LC-36 will sport both a refurbishment building for recovered New Glenn boosters and an integration facility. 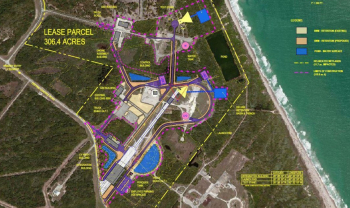 The refurbishment building, according to a 2016 environmental impact report, will be constructed at the entrance to the current LC-36 complex. 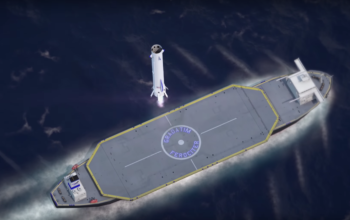 Unlike SpaceX which employs both Return To Launch Site (RTLS) and drone ship landings of their Falcon 9 – and soon to be Falcon Heavy – boosters, Blue Origin has no plans to attempt RTLS landings of New Glenn boosters. Instead, all New Glenn boosters will land on a ship in the Atlantic Ocean – where the boosters will be safed and then returned to Port Canaveral for refurbishment and reuse. Back at LC-36, a new integration facility will be a 150,000 sq. ft (13,935 sq. m) building that will be used for final assembly of all major launch elements of New Glenn. According to the 2016 environmental report, the integration facility will be the location where “final mechanical and electrical connections, final integrated [launch vehicle] readiness testing, and final ordnance connections prior to rolling the [vehicle] out to the launch pad” are conducted. In addition to the buildings, foundations have already been dug, leveled, and poured for the new LOX and methane storage tanks that will hold New Glenn’s propellant before it is pumped into the rocket. No update was noted for the LH2 tank – though it is likely just as far along or just slightly behind the preps for the methane and LOX tanks. The methane, LOX, and LH2 tanks are being built to support not only fueling and launch operations of New Glenn from LC-36, but also BE-4 engine test firings at neighboring LC-11 – thus allowing the propellant/oxidizer storage tanks to serve a dual purpose. 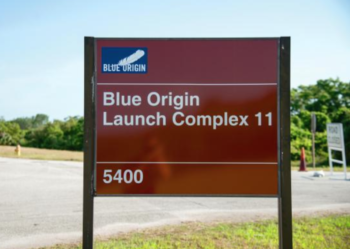 LC-11 is LC-36’s neighboring pad to the north, and Blue Origin announced earlier this year that pad 11 will be the site of BE-4 engine acceptance and test firings at the Cape. Thus, LC-11 will sport a new engine test stand. According to the 2016 environmental impact assessment, “A single engine test stand will be constructed in the vicinity of LC-11 for acceptance testing of the BE-4 engine. At most, 30mins of engine testing per month is expected, with about nine tests per month. Last month, Blue Origin successfully test fired their first BE-4 engine at the company’s site in Texas. 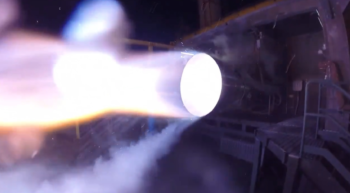 The test was a significant and important step for Blue Origin – as the BE-4 is slated to not only power New Glenn to orbit in the 2020s but will also serve as the sole liquid fueled engine at the base of United Launch Alliance’s under-development Vulcan rocket. 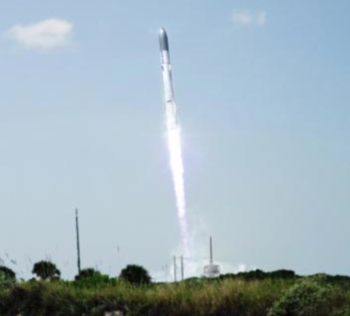 Unlike all of the other companies currently launching orbital rockets from the Cape Canaveral Air Force Station or the Kennedy Space Center, Blue Origin will be distinct in that it will produce all of its rockets at the launch facility itself – specifically in its gigantic production facility under construction on Merritt Island. Blue Origin will also build their Launch and Landing Control Center, called the L&LCC, as well as their mission support center near the factory building. The factory building itself is on track for dedication in mid-December and occupancy by February 2018 – though Mr. Henderson notes the building will likely be ready for occupancy a month ahead of schedule in January 2018. According to Mr. Henderson, the facility will contain the largest carbon AFP (Automated Fiber Placement – advanced method of manufacturing composite materials) machine and the largest autoclave in the world as well as a stir welding machine comparable to what NASA’s SLS program uses. With each first stage booster planned to be reused up to 100 times, the factory will mainly concentrate on – and for large periods of time is only planned to – produce 2nd and 3rd stages. Mr. Henderson noted that once the first stage boosters are retrieved after flight, their storage will be managed across the refurbishment facility at LC-36 (capable of holding three or four boosters), the integration facility at LC-36 (also capable of holding “at least” three or four boosters), and the Merritt Island production facility (which can hold four boosters).